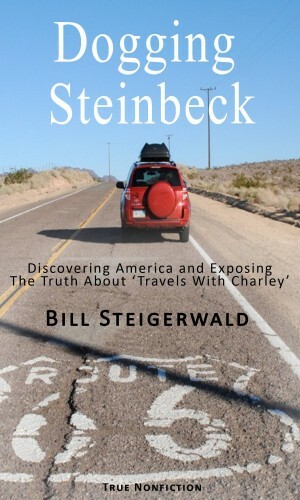 For decades fans of “Travels With Charley in Search of America” have jumped in their cars and RVs and used the iconic book as a way to retrace the road trip John Steinbeck tookin the fall of 1960. The idea of hitting the open highway and finding yourself or your country is a romantic idea, no matter how old or cyncial you are. But Steinbeck’s “nonfiction” book is not a very good or accurate account of his 10,000-mile trip from Long Island to Maine to Seattle to California to New Orleans and back to New York City. Though it has always been considered nonfiction — despite glaring signs of fictionalization — “Charley” is often fuzzy about time and place. It’s not a travelogue and wasn’t meant to be a work of journalism, so it’s often vague and confusing. The book also includes scenes of several lonely overnight campouts under the stars that didn’t happen and it omits many things Steinbeck did with his wife Elaine when she joined him for a month on the West Coast. In the fall of 2010 I wanted to retrace Steinbeck’s route as faithfully as possible to see the America he saw and to compare his real trip with the mythic one he created by mixing fact and fiction. Steinbeck took no notes and left no expense accounts. To find out where he actually was on his journey and when he was there, I had to create a time-and-place line from many sources. I used the “Charley” book; newspaper articles from 1960 and later; letters he sent to his wife Elaine and others from the road; the biography of Steinbeck by Jackson Benson; the manuscript of the first draft of “Charley” and the drive-by journalism I did on the Steinbeck Highway. When I retraced Steinbeck’s route for “Travels Without Charley” I was able to find some of the places he stayed – the exclusive Spalding Inn in New Hampshire, the modest Westgate Motel in Beach, N.D. But I was also completely stumped in Livingston, Mt., and at the Seattle-Tacoma airport. Where he stopped in Maine the night of Sept. 28 is also a total mystery. The book “Travels With Charley” hit the bookstores and the nonfiction bestseller lists in the summer of 1962. But the road journey “TWC” was based on started when Steinbeck and Charley left Sag Harbor on Sept. 23, 1960, and it ended when they returned to New York City around Dec. 5, 1960. Based on what I have learned so far, here is an imperfect but complete time-and-place line for Steinbeck’s 75-day trip. Photos will take you to video I shot. John Steinbeck’s home by the sea in Sag Harbor, N.Y. He takes three ferries across Long Island Sound to New London, Conn., 36 miles away, then heads for his son’s boarding school in Massachusetts. The apple orchard on a dairy farm in Deerfield, Mass., where Steinbeck camped while visiting his son. In the book he doesn’t say much about his visit or how many nights he spent at Eaglebrook. But in a letter to his wife, he makes it clear that he was there until Sunday morning, when he woke up late and almost missed church. The neglected apple orchard where Steinbeck camped Sept. 23 and 24 while visiting his son John at the Eaglebrook School in Deerfield, Mass. Sept. 25, 1960 – White Mountains, N.H. In the book, Steinbeck and the farmer talk about Khrushchev banging his shoe on his desk at the United Nations, but that conversation couldn’t have happened. That famous Cold War event — if it actually happened that way — occurred Oct. 11, 1960. Fifty years later, after searching in vain for the farm and the farmer near Lancaster, a local writer, Jeff Woodburn, learns that Steinbeck was seen in the fall of 1960 at the nearby Spalding Inn. Update: On March 30, 2010, a woman who worked for the Spalding Inn’s owner at the time said she is absolutely certain Steinbeck slept at the inn for one night. And Donald Spalding, the son of the original owners and operators of the inn, said on March 30, 2010, that there is no doubt that Steinbeck ate dinner and slept at the inn during “foliage season” of 1960. Steinbeck says in “Charley” that he stops at a motel near Bangor, Maine. But he is so put off by the sterile and plastic environment in his room that he ends up going out into the parking lot and sleeping in his camper. In fact, he drove from Vermont to Deer Isle, an island about 60 miles south of Bangor, where he parks on the property of a woman his agent knew and sleeps in his truck. Steinbeck and Charley continue their stay on beautiful Deer Isle, Maine, which Steinbeck’s agent, Elizabeth Otis, insisted he must see. Steinbeck visits the lobster fishing port of Stonington and sleeps Tuesday night on the grounds of the gorgeous seaside home of Eleanor Brace, where Otis rented a small cottage each summer. He leaves Deer Isle late Wednesday afternoon, drives north on U.S. 1 along the seascoast and spends Wednesday night at an unknown location. According to a letter he mailed from Deer Isle on Wednesday, Sept. 28, to Adlai Stevenson, Steinbeck heard part of the first televised presidential debate between Richard M. Nixon and John F. Kennedy on Monday, Sept. 26. He was distressed that both candidates were so courteous toward each other. Driving north on U.S. Route 1, past the border town of Calais, on Thursday Steinbeck reaches the top of Maine and Aroostook County, a major potato-growing area. Then he turns south and drives through Maine’s pine wilderness on State Route 11. In “Charley” he says he threw a little after-dinner ”party” in Rocinante for a family of French Canadians who cross the border each fall to help with the harvest. But he could not have partied with the Canucks the way he describes in the book, since he told his wife in a letter from the road that on Thursday night he slept overnight in Rocinante near a cement bridge in a heavy rain. If he met the Canucks, it had to be Wednesday evening. But that is unlikely, because he didn’t have enough time to drive to potato country from Deer Isle, meet the Canuck family and stage his party. Sept. 30, 1960 — Lancaster, N.H.
Steinbeck says in “Charley” that he drives ”long and furiously” all day from northern Maine via State Route 11 and US Route 2 to Lancaster, N.H. He says he sleeps in his camper near a ”ghost” motel/lunch counter by the Connecticut River (the Whip o’ Will), where no one is around to rent him a cabin. Oct. 1-2, 1960 — Somewhere near St. Johnsbury, Vt.
On Saturday, Oct. 1, Steinbeck mails a postcard from Concord, Vt. He heads west, crosses into New York from Vermont at Rouses Point and heads south on US Route 11 to New York Route 104, where he turns west toward Niagara Falls. He writes in “Charley” that on Sunday morning, which would have been Oct. 2, he attends services at a white wooden John Knox (Methodist) church in Vermont and heads west. He doesn’t name the town or church and today no one in the area seems to be able to figure out which church it was — or if his “mystery church” really existed. New England is crawling with “blazing white” wood churches like “The White Church,” which is in the village of Deerfield, Mass., where Steinbeck’s son John went to the Eaglebrook School. Eaglebrook students walked to the church on Sundays and Steinbeck probably attended services there the previous Sunday, Sept. 25, 1960, when he stopped to visit his son. Was that the white church? Probably not. Oct. 2 or 3, 1960 — Niagara Falls, N.Y.
Steinbeck’s original plan to cross the border into Canada at Niagara Falls, cut across southern Ontario and re-enter the United States at Detroit is foiled by the inoculations Charley should have but doesn’t. After staying at a fancy Buffalo motel, he takes the New York Thruway, now I-90, to Madison, Ohio. He then drives west on U.S. 20 and the Indiana Toll Road to Chicago, where his wife Elaine flies out to meet him for four or five days. In “Charley” Steinbeck says that on his way to Chicago he camped by a small lake in the middle of nowhere near the Indiana-Michigan border. When he arrives in Chicago he stays downtown at the Ambassador East Hotel, a celebrity haunt famous for its Pump Room. Adlai Stevenson’s farm in Libertyville, Illinois. His wife, Elaine, flies out from New York to join him. Sometime during their stay in Chicago, probably on Sunday night, Oct. 9, Steinbeck, his wife and Charley spend a night with Adlai Stevenson at Stevenson’s 40-acre farm in nearby Libertyville, Ill.
Oct. 10, 1960 — Mauston, Wis.
Steinbeck and Charley leave Chicago on Monday morning Oct. 10 in Rocinante and begin their 7-day Sprint to Seattle by heading northwest into Wisconsin on U.S. Route 12. Wife Elaine returns to New York City, but will rejoin them in Seattle. Oct. 11, 1960 — Frazee, Minn.
Steinbeck and Charley crawl slowly past Minneapolis-St. Paul on U.S. 10 and, after driving almost 400 miles, stop for the night at a truck stop in Frazee, Minn., near Detroit Lakes, 60 miles east of Fargo, N.D. In an Oct. 11 letter to his wife from Frazee, Steinbeck says he watched cattle being loaded into trucks by floodlight (almost certainly at the facilities of Daggett Truck Line, which still exists at the same location). In “Charley,” he creates a composite truck stop by blending his Monday night stop in Mauston and his Tuesday night stay in Frazee into one night at one truck stop. Oct. 12 (Columbus Day), 1960 — Alice, N.D.
On the road from Frazee, Minn., by 6 a.m., Steinbeck drives about 130 miles west on U.S. 10. About 25 miles west of Fargo, N.D., he turns south and goes to Alice, N.D., population 124 in 1960. He says in ”Charley” that he camped overnight near Alice along the tiny Maple River and met an itinerant Shakespearean actor. He didn’t do either, however. Oct. 12, 1960 — Beach, N.D. In ”Charley” Steinbeck says he camped overnight in Alice, N.D., by the Maple River. But that same night he sent a letter to his wife from Beach, N.D. – 321 miles to the west – and joked that he was staying in the “Dairy Queen” motel (probably the Westgate Motel, which was across the street from a Dairy Queen). In “Charley” Steinbeck also describes camping overnight in the Badlands. But since he left Chicago on Monday morning Oct. 10 and stopped Monday night in Mauston and Tuesday night in Frazee, he could not have camped overnight at Alice and also camped overnight in the Badlands and still have slept at the “Dairy Queen” in Beach on Wednesday, Oct. 12. Not unless that week had nine days. Oct. 13, 1960 — Near Bozeman, Mt. Downtown Livingston, where Steinbeck bought a jacket. Steinbeck travels southwest from Beach, N.D., across Montana on U.S. 10, now the route taken by interstates 94 and 90, and stops for the night near Bozeman. In a letter to his wife Elaine that night he writes that after taking a side trip south at Custer to visit the Custer Battlefield site that morning, he stopped at Billings to buy a hat, stopped at bars in six small towns and bought a jacket in Livingston. Steinbeck says in the letter that he’s staying “in a trailer park” … “outside of Bozeman.” In his original manuscript, in a passage that was cut from the final version of “Charley,” he said he stayed at an “auto court” in Livingston and watched the third Nixon-JFK TV debate in his room. Before heading west on U.S. 10 from Livingston, Steinbeck abruptly decides to drive about 55 miles south on U.S. 89 to the north entrance to Yellowstone. After Charley goes nuts every time he sees a grizzly bear, Steinbeck quickly leaves the park and retraces his path north to U.S. 10. He says in “Charley” he stayed the night in ”a pretty auto court” near Livingston, Mt. But in a letter to his wife that he wrote on the evening of the same day he went to Yellowstone he said he was camped for the night on an old woman’s land “past” (west of) Missoula and 60 miles short of the Idaho line. That would be near Tarkio, Mt., but local oldtimers there were unable to provide any clues when contacted in February, 2011. Steinbeck probably did not sleep in his camper again for at least another month, when he was on his way from Monterey, Calif., to the Texas Panhandle for Thanksgiving. As Steinbeck drove toward Idaho on U.S. 10 on Oct. 14, he went through downtown Butte and stopped at Phil Judd’s Sporting Goods store (right) to buy a Remington rifle and a Weaver scope for $73.50 (a Butte native, writer/artist Bill Baltezar, later wrote about meeting Steinbeck in the long-gone store but his article is filled with errors and not credible). Steinbeck says in “Charley” that he stopped at an isolated motel/gas station in the mountains near the Idaho-Washington border, where he mediates an argument between a burly man and his theatrically minded son who wants to become a hairdresser and live in New York City. But since Steinbeck had camped the night before about 40 miles west of Missoula, it’s unlikely he would have stopped for the night in northwestern Idaho after driving fewer than 200 miles. Where he really slept Oct. 15 is a mystery with no clues. Oct. 16, 1960 — Spokane, Wash. In “Charley,” Steinbeck writes that Charley is sick and at dawn he rushes him to an inept alcoholic vet in the outskirts of Spokane. He then sets out on U.S. 10 for Seattle, 300 miles away, where his wife Elaine will fly out to join him again. Whether he really took Charley to the vet is not known. Steinbeck arrives in Seattle, via U.S. 10 (now I-90), and goes to the Seattle-Tacoma airport. As he described in scenes cut from his first draft of “Charley,” he waited at a fancy modern motel for three days while Elaine tried to get a ticket on a jet from New York. After Elaine arrives, Steinbeck gives her a tour of his old haunts in Seattle’s old port district. Steinbeck, Elaine and Charley begin their slow move down the Pacific Coast on scenic U.S. 101 along the Oregon coast and through the redwood country of northern California. They stay at ”pleasant auto courts” but there is no mention in “TWC” or the original manuscript whether they saw the spectacular Oregon coast line. Steinbeck wrote several scenes detailing this part of the trip in his original manuscript, but they were cut completely or edited to remove evidence of his wife Elaine’s presence. On a rainy Sunday on a muddy road near an unnamed town ”somewhere” in Oregon, Steinbeck writes in “Charley,” his overloaded vehicle has a flat. As his wife Elaine sits in the cab (according to his first draft), Steinbeck lies in the mud to change his tire. He needs two new tires. To Steinbeck’s eternal gratitude, an ”evil-looking service-station man” goes out of his way to find the tires. On Monday, Oct. 24, Steinbeck sends his editor a post-card from Trinidad, California, where he says he and Elaine are staying by a redwood grove. Trinidad is on U.S. 101 about 300 miles north of San Francisco. The Steinbecks — John, his wife Elaine and Charley — spend several days among the giant redwoods in Humboldt County on U.S. Highway 101, aka the Redwood Highway. Steinbeck describes a nearly empty resort in the original draft of the book. It sounds like it might have been the now-closed Hartsook Inn, which was a favorite of Hollywood celebrities. After nearly a week on U.S. 101, Steinbeck, Elaine and Charley arrive in San Francisco. Keeping to their upscale lodging habits, they stay at a suite at the St. Francis Hotel downtown and spend about five days socializing with friends at the city’s top North Beach bars and restaurants. Steinbeck is interviewed in his suite on Oct. 28 by a San Francisco Chronicle freelance writer and discusses his writing and his partisan views on the coming presidential election. Charley has been checked into a kennel. Oct. 30 – Nov. 15, 1960 — Monterey, Ca. They stay for about two weeks near the City of Monterey in the modest Steinbeck family cottage in the coastal town of Pacific Grove, half a block from the ocean and about a mile from Cannery Row. Steinbeck is not happy with Cannery Row, which was starting to exploit his fame as a tourist draw. The Monterey Peninsula Herald finds Steinbeck leisurely fixing the cottage gate on Nov. 3, 1960, and takes his picture. Before he leaves the place he knows he can never call home again, Steinbeck writes in “Charley” that he went to the top of Fremont Peak to take a final look at the part of the world he made famous. His goodbye to his past is some of the book’s finest writing. On about Nov. 15, he and his old friend and lawyer Toby Street head east in Rocinante. 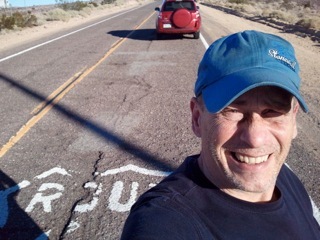 After leaving Monterey, crossing the Mojave Desert and picking up Route 66 at Barstow, Calif., Steinbeck and Charley drive 1,300 miles to Amarillo. Wife Elaine has flown on ahead. One of Steinbeck’s old friends rides along with him in Rocinante for four days from Monterey to Flagstaff, Ariz. Along the way, Steinbeck says in his book that he and Charley camp along U.S. 66 near the Continental Divide near Gallup, N.M.
Because he has to get a window in his truck fixed, Steinbeck says in “Charley” that he spends “three days of namelessness in a beautiful motor hotel in the middle of Amarillo.” Charley is sick and Steinbeck writes that he takes him to a kind vet. Steinbeck says he arrived the day before Thanksgiving (Nov. 24) at a millionaire’s cattle ranch east of Amarillo (owned by his wife’s ex-in-laws). Steinbeck stays in Texas for about another seven days, visiting his wife’s friends and relatives. After seeing TV and magazine reports about the ugly racial events outside an elementary school in New Orleans that was being integrated for the first time, Steinbeck decides to see it for himself. He and Charley drive in from Texas, and Steinbeck observes the foul-mouthed white mothers – ”the Cheerleaders” – who gather each morning to shout crude invectives at white and black children and their parents as they arrive at the William Frantz Elementary school. Steinbeck is repulsed by what he sees and his verbatim account of their vulgarisms — though sanitized by editors — is considered the most powerful part of his book. Dec. 3, 1960 — Pelahatchie, Miss. Just east of Jackson, Miss., Steinbeck mails a postcard to his agent, Elizabeth Otis, from Pelahatchie on U.S. Route 80. In the card he says that after leaving New Orleans, he went upriver to Natchez and Vicksburg, Miss. Dec. 4-5, 1960 — Abingdon, Va.
Driving home in blur, tired and dispirited, Steinbeck says in ”Travels With Charley” that at Abingdon on U.S. 11 he realizes his journey is over. All he wants to do is get home to his own wife, house and bed in Manhattan, which is still about 650 miles to the northeast. After speeding up the western edge of Virginia, he writes that ”I bulldozed blindly through West Virginia, plunged into Pennsylvania and grooved Rocinante to the great wide turnpike” (the Pennsylvania Turnpike at Carlisle). He then navigated the heavy traffic of the New Jersey Turnpike toward New York City. In “Charley” Steinbeck said he was denied entrance to the Holland Tunnel because of the propane tank aboard Rocinante. He takes the Hoboken Ferry, gets lost in evening rush hour in downtown Manhattan and has to ask a cop for directions. He had been gone nearly 11 weeks, touched 33 states and had driven about 10,000 miles. He finishes writing ”Travels With Charley in Search of America” until late summer of 1961. It appears in three installments in Holiday magazine and isn’t published in book form until July of 1962 — three months before he’s awarded the Nobel Prize for Literature. “Charley” becomes an instant nonfiction bestseller. It receives generally favorable reviews. It quickly becomes an iconic American road book. And for the next 48 years it is accepted as the true account of his road trip.